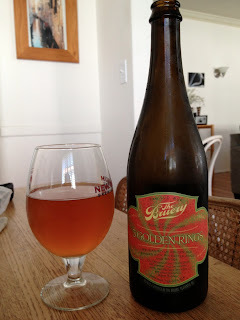 We haven't really reviewed too many of the Bruery's fare around here, probably because pretty much everything they offer is absurdly expensive. But this one's relatively reasonable, especially along with a hefty ABV. 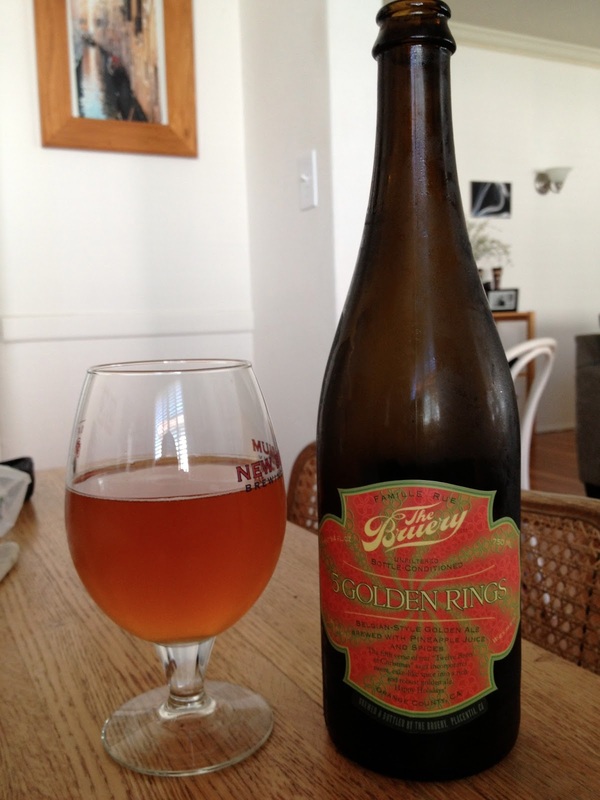 Five Golden Rings is, as you might imagine, a Christmas release, but even in June you can come across it in some of the smaller liquor stores. And of course, this is the fifth in a presumably 12-beer series following the traditional carol. I hear they're cellaring a bit of each one, so if you time it right you could get a massive vertical tasting. Anyway, this one's brewed with pineapple juice, which is really only Christmas-y in Hawaii. It actually smells like a sour, light-bodied, a bit yeasty, and quite tart. You can tell right off the bat that it'd be a perfect summer beer (not for sessioning though, of course)...I guess you could celebrate half-Christmas with it? I had this when it came out and thought it was really tasty, kind of like Horny Devil plus pineapple. Six months after the fact, it's pretty boozy, enough so that it interferes with the other components. The pineapple and yeast flavors are still there, but the latter in particular feels like it's withered a bit. Since the pineapple remains pretty strong, and the yeast is on the weak side, it feels a little imbalanced and sharp, kind of like a pineapple mimosa with too much vodka. The bottle says this is suitable for aging up to seven years, and I have no doubt that's true, but I hope the decay function of the yeast flavors isn't linear. So I'd counter the bottle and say drink this fresh. But obviously at this point that's entirely impossible, so it's not helpful at all. Still, if you come across a bottle, give it a whirl because it's a worthwhile effort and the pineapple is tasty. And really, once you've had a half a glass or so, the alcohol has dulled your tastebuds enough that you don't really care about the flaws anyway.